The possession of a natural ability, unique skill or set of skills which sets one apart from the crowd is often regarded as talent. The good thing is that everyone is blessed with it. Whether they have discovered it or not is another matter entirely. It doesn’t matter if it is something as seemingly mundane as has having magical hands as a masseuse, being a naturally good street sweeper or the more highly exalted talent of being a great computer programmer or rocket scientist. Every single person on the planet is talented at one or more things. And that is awesome! What I find intriguing however is the often undue exaltation of talent above other attributes that are equally crucial (if not more) to a person’s chances of being successful. While I cannot fault the notion that discovering and channeling one’s efforts in line with where one has natural gifting and flair would most likely provide the best chance of excelling while also giving utmost fulfillment, when I remember that everybody is talented at something and there are millions of other people who possess the exact same talent, then more and more, I am convinced that talent is not enough. It is incapable of being enough. Perhaps the best example of this can be found in the world of football. This generation like no other has been privileged to be alive to witness the exploits of two gods of the round leather game. While the Argentine, Lionel Messi is widely believed to be naturally imbued with immense talent for the game, his Portuguese counterpart Christiano Ronaldo’s exploits and rise to the height of football prominence is largely seen to be due to a culmination of his consistent commitment to self-improvement, practice and hard work on and off the pitch of play. Now, if Ronaldo is not as talented as Messi (as many believe) when it comes to football, yet has given him a good run for his money. Virtually competing with the little man on all fronts for the various football awards and number of records set and broken, then it is correct to posit that while talent ensures that one gets things done with more ease, hard work and persistence at getting better can compete favourably with talent, and what’s more, outshines talent when talent gets complacent. I disagree with the suggestion that anyone is preordained to be successful at anything. Being engaged in one’s natural field of inclination may increase a person’s chances of becoming successful, however, every single day, stereotypes are shattered by ordinary people who may not necessarily be the most talented, but they defy popular belief through their zest to succeed. All too often, I see hard work in particular not only compete with talent, but also trump it. Let’s face it; talent is a dime a dozen. Many are multi-talented. Many are super talented. What sets an individual apart from the pack is their level of commitment to improving their craft through a resolute “can-do” spirit, diligence, consistence, focus, persistence and the ability to remain teachable. Of course, there is the place of providence too, which some call luck or chance. There are many actors, writers, executives and professionals in various fields of endeavour who are very talented, yet cannot be deemed successful. Several studies have showed that talent can only take one so far and there are other attributes that are as important to the achievement of success. The legendary Majek Fashek is no doubt one of the greatest reggae artistes that not just Nigeria, but Africa has ever seen. A bundle of talent who ruled the airwaves in the eighties. Unfortunately, his talent couldn’t save his career when it began to spiral downward as a result of his battle with substance abuse. World renowned celebrities and artistes like Micheal Jackson and Whitney Houston were power houses of talent who rose to the pinnacle of their careers, but fell fast too, because talent may take a person to the zenith of their profession, but would hardly sustain them there. 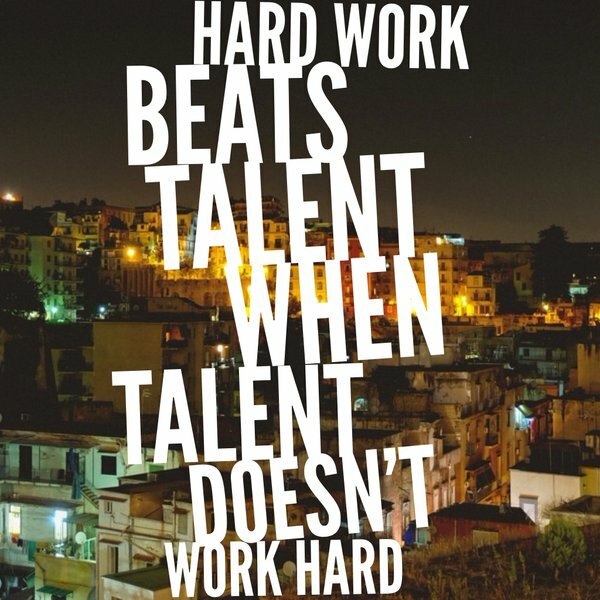 The virtues of hard work and perseverance have gotten far less talented people to the top. Their tenacity of purpose and sheer will to make something of their lives (which is usually lacking in highly talented people) ensured that they became a force to reckon with in the scheme of things. Nevertheless, a combination of talent and the values of hard work, an unwavering commitment to craft and its expression remains the magic formula to the attainment and sustenance of success. Talent is fantastic. It gives us a sense of self-worth. But, consider this – you have talent. Everybody has talent. It invariably means that to stand out, you have be willing to do something extra. Talent will never be enough. It’s simple. Even a book has been on this subject. Thanks for this reminder. I’ve covered something on this before in which i was privileged to mention ‘Nigeria’s finest blogger’ who has consistently combined her talent with hard work even in the most unpleasant situations. Failure to put hardwork into the natural gift is why we have half baked people. I do hope people change by reading this. ? Well said Lolo. Talent is as cheap as table salt. You need to add something extra. Lol. Good analogy. Thanks friend!